Which is really just a lot of photos of penguins, since we didn’t take a camera with us into Capetown. Rather than braving the crowds on the Point, we went to Betty’s Bay, site of another of the 3 or 4 local penguin colonies. This site is reached by driving toward the end of a nice residential neighborhood and parking near the sea, then walking along a boardwalk to the shore. The boardwalk is raised to protect the landscape, and there is a meshwork underneath to keep the penguins on the seaward side. The penguins didn’t get this memo, as they have gleefully burrowed underneath the boardwalk and are heading up the hill toward the houses. Apparently since they are endangered, the penguins pretty much get right-of-way. We were a bit worried than in another season they would have taken over the nearest house, and would be sitting there, flippers up, snacking on herring while watching water polo on a large-screen TV. 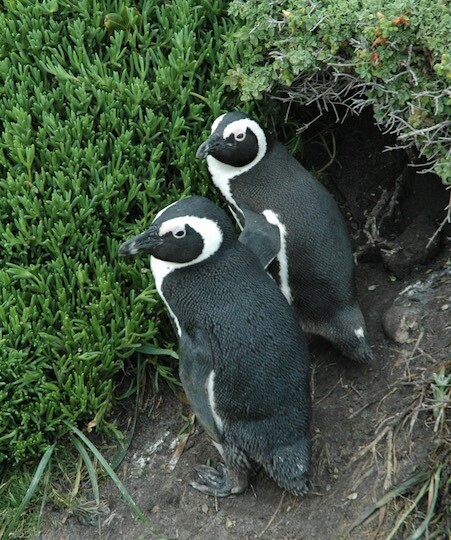 The sign at the start of the boardwalk sums up the entire experience: "African penguins, comical but vulnerable”.